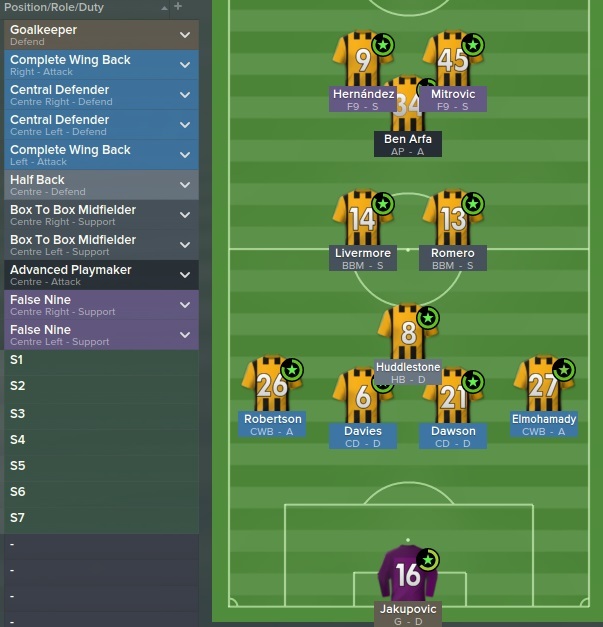 I am the Tinkerman, known for my ability to use various tactics on FM to achieve success, this is my first attempt in the Best FM 2015 tactics series. In recent seasons the diamond formation has become popular, notably with Liverpool last season whilst other teams such as West Ham and England have also experimented with the diamond formation. Therefore I have produced a winning diamond formation which I have tested with Man United and Hull City. As with all tactics it is important to have players which suit the formation and player roles. The advantage of this formation is that it allows the selection of two strikers which is particularly useful if your squad has a number of quality strikers. As shown above the formation is quite narrow, leaving the team strong in numbers through the centre of the pitch. When attacking the wing backs push forward and provide the majority of the width. The half back drops in between the central defenders who split to almost form a back three. When defending the half back and two box to box midfielders provide reasonable protection to the back four and the two false nines drop deep which helps to stifle attacks as most of the team are usually behind the ball. DR/DL: complete wing back attack (attack) – Very important players in this tactic, providing lots of crosses and assists. Therefore technical ability is important including crossing, dribbling and passing. Pace and stamina are also key due to the amount of work these guys need to do on the flanks. DC: central defender (defend) – Typical central defenders attributes. I also like to partner a defender with good aerial ability with one that is quite pacey to provide a balance. DMC: half back (defend) – Important attributes for a defensive midfield player include stamina, tackling, positioning, passing etc. MC: box to box midfielder (support) – all round midfielder who can help out the defence and supplement the attack, high work rate is useful. At least one of these guys should be defensively minded with high attributes for tackling, positioning etc. AMC: advanced playmaker (attack) – key attributes would be first touch, passing, technique and vision, basically a technically gifted and clever player. ST: false nine (support) – they tend to drop deep when defending which is helpful. Teamwork, vision and passing ability are key as they tend to provide a number of assists. Also important that they are good finishers and having decent aerial ability would be useful due to the number of crosses from the wingbacks. These instructions are self explanatory and should work against stronger and weaker teams. This tactic will not dominate the opposition with large shares of possession (approx. 50/50) but it will pepper the opposition goal with shots. If there too many long shots being taken without success you should change the individual instructions for that player to shoot less often. Good victories against the other PL teams. Disappointing to go out in the fifth round, although it was against a quality arsenal side, we created more chances than Arsenal, 3 clear cut chances and 4 half chances so it was disappointing to only score one goal. The Europa league was used as a means of resting players as I made the premier league the priority. The chairman was pleased to reach the 1st knockout round as he had only targeted reaching the group stage. Fantastic run of victories in December, April and May help us on our way. Only conceding 7 goals in the last 15 league games was also vital en route to the league triumph. A clear victory over Chelsea by 7 points!! As everyone can identify, the current match engine results in a lot of goals from crosses in wide areas. To help defend against this, I recommend employing the following opposition instructions on wide midfielders and forwards to reduce the number of crosses into the box. Always tight marking, always closing down and hard tackling. Try to cash in on wide attacking players as they are not needed for this system and use the money to buy players best suited to these roles. I always try to have 2 suitable players for each position. 5. Then Import and then load ‘Tinkerman’s diamond into your game, then you will be able to select the tactic from the list. is it working on v15.1.4 ? Just for other people’s information – i am playing on the latest update. Picked up a 5-0 home win to Arsenal last night (playing as southampton) who are 3rd in the league with myself top by a point. 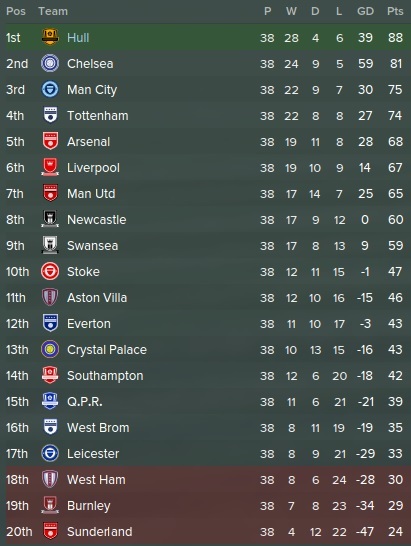 I implemented the tactic in the November of my current season and I am now in Jan.
also beat man city 3-0. This is working well for me, dominating games and loads of shots but not scoring any goals! Any tips? Hi Rob, what team are you playing with? The goals will come with time. Are many of the shots long shots? Arsenal. Using Giroud and Berbatov up front because I thought we could do with a better play maker than Welbeck as Welbs wasn’t scoring at all (no goals in 8 games). Yes an awful lot of shots seem to be from long range. Try setting individual player instructions of shoot less often to the players having the most wasteful long shots. I would say your box to box midfielder’s mainly. Seems to work on the update, my form once my strikers started to score was top 2, unfortunately I had inflicted too much damage before Christmas. Next season should be more profitable. Although in your defence I’m going through that ‘smash one on ones at the keeper and hit the post 15 times a match’ phase so it’s probably just that. Hey Tinkerman, good tactic with PSG atm and have lost 2 games in the CL but will qualify 2nd in the group. Mind you I have sold a lot of the senior player ibra and silva and have younger players performing. Just a note I hit the cross bar quite a lot and my defenders and mids do most the scoring. Overall a good tactic, Keep up the good work. i play a very simular formation, but i keep possesion and play flexible, should i chaange to fluid ? Did you use control for every game? Yes I did, which is not usually the strategy I adopt, usually I would play counter away from home against the bigger teams. But for this tactic we were able to win away at chelsea and man city and draw away at man utd with control, which I was very happy with!! Worked for me in my first game! I had already lost with my PAOK team 0-4 against Juventus! And i won 0-1 in the away game!! !Thank you for my 3 points in the Champion’s Cup Group Stage!!! 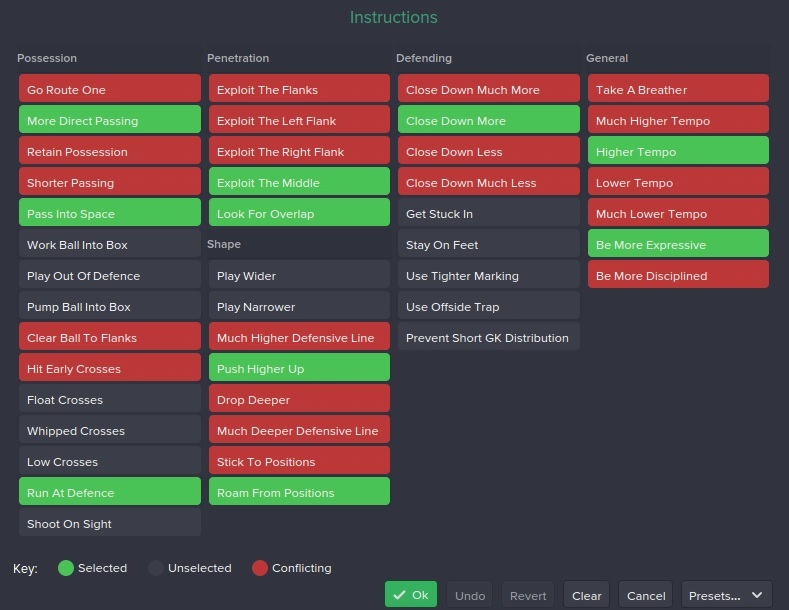 Just started using this tactic, working well so far.what do you use for training/match preparation mate? For this tactic I switched between defending/balanced training and for match preparation I generally switched between attacking movement and teamwork depending on the opposition. Sorry for late response mate! This tactic, with some slight variations, is giving me great success with my man utd team. With Di Maria as a roaming playmaker in one of the CM roles and Rooney as my box to box CM, I have maintained an unbeaten run up until november, 11 wins and 1 draw, with a 3-0 win over chelsea, 3-1 win over man city, and 5-1 against everton. The false nine roles work really well for forwards that you wouldn’t expect it to, such as falcao, and the CM roles work really well even for players with little defensive focus. Do you actually know if this tactic works post-update (v15.3.0)? If my team hasn’t 2-3 good attackers for F9 role, can I use some other role for one of the attackers? This tactic is total disaster. What are the individual player instructions?